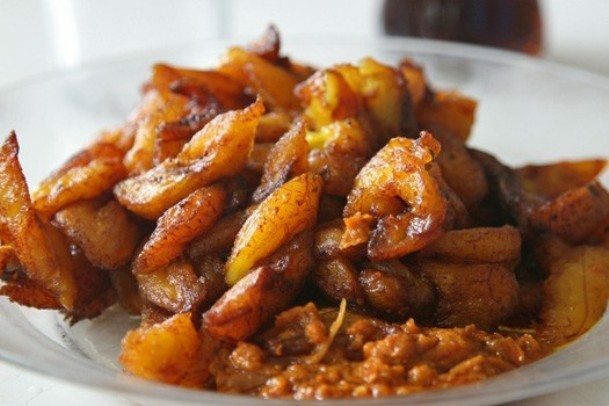 Alloco is an Ivorian fried plantain snack often served with chilli pepper, onions or egg and tomato sauce. Alloco is quite popular in the Ivory Coast but its popularity extends across the surrounding African countries especially within the Western African coast, usually for its ease of preparation and its unique taste. Alloco is a perfect meal for any occasion at any time of the day. Widely served as a fast-food readily available on the streets of Côte d’Ivoire, the palatable African dish could not help but make a name for itself in the Cocody neighbourhood as food vendors widely known for grilled meat and alloco commonly go by the name, allocodromo. 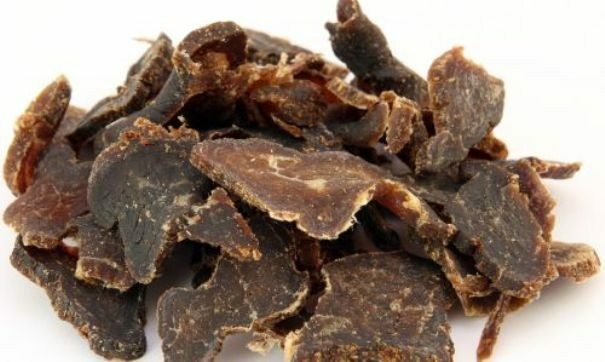 Biltong is a South African food similar to Jerky. It is usually made from beef which is sliced, bathed in vinegar and spiced with selected biltong spice and then allowed a long time to slow-dry in a dry airy space or under a low heat. 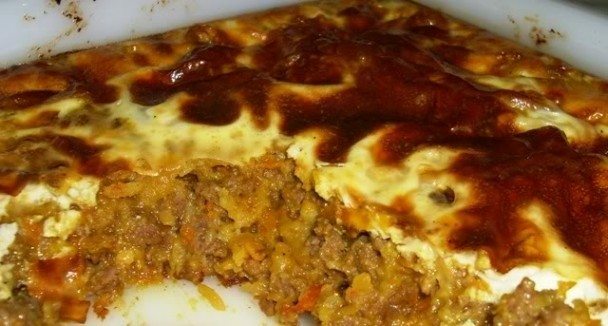 Pronounced ba-boor-tea, Bobotie is the national food of South Africa and is a delicious mixture of curried meat and fruit with a creamy golden topping that is similar to moussaka. Often times, Bobotie consists of spiced minced meat baked with an egg-based topping and served with Sambal. It is assumed that colonists from the Dutch East India colonies in Batavia introduced bobotie to South Africa after which it became popular with Cape Malay community (in the Cape of Good Hope) South Africa at which time it was made with a mixture of mutton pork. Brik is a popular North African food, precisely a Tunisian meal that served as a stuffed pastry that is usually deep-fried. Brik comes in different forms and one of the well-known type is the egg brik which is made from a whole egg placed in a triangular pastry pocket with chopped onion, tuna fish, harissa and parsley. Some other typical fillings include ground meat, chopped boiled egg, chicken, or anchovies garnished with a fried egg and harissa, capers or cheese. There is also a (supposed) cultural significance of brik in Tunisia. According to the Tunisian tradition, the bridegroom’s mother-in-law to be makes a brik for the potential bridegroom and if the bridegroom eats it without spilling any of the egg yolk he may go ahead and marry the bride. 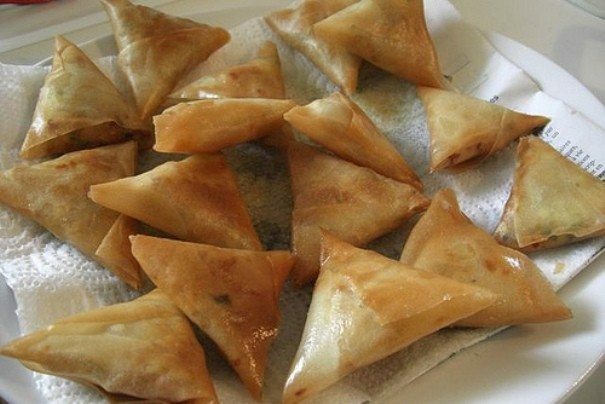 Briouats are fried or baked Moroccan pastries which are usually folded into triangles, stuffed with varieties like chicken or lamb and mixed with cheese, lemon and pepper and then fried. 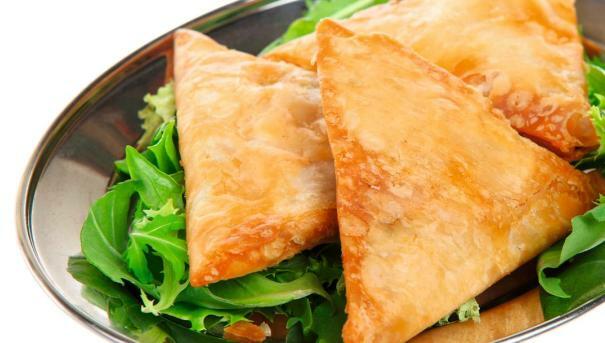 This recipe features ground meat enclosed in crisp, paper-thin Moroccan pastry called warqa . Phyllo (filo) dough or spring roll wrappers can be substituted for the warqa . In most cases, briouats are usually served as appetizers, but can also be served as a full meal. This filling is mildly seasoned. Cholent is a classic Jewish food, traditionally cooked overnight on a Friday and eaten for lunch on the Sabbath. 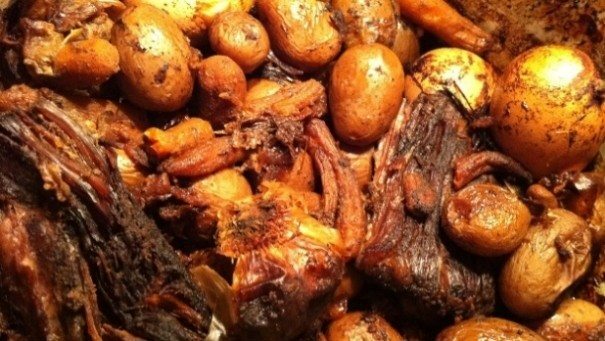 It is a slow-cooked stew of meat, potatoes, beans and barley that is also prevalent in the Northern part of Africa. There are many variations of the cholent, the basic ingredients used in preparing cholent are meat, potatoes, beans and barley. Rice may be used in place of barley, and chicken in place of beef. In the traditional Sephardi-style, hamin, whole eggs in the shell are used which turn brown overnight. Ashkenazi cholent often contains kishke orhelzel – a sausage casing or a chicken neck skin stuffed with a flour-based mixture. Fufu is a paste made from starchy root vegetables (mostly from cassava) originally from Ghana. It is made from different sources like cassava, yams or plantains which are pounded into a dough-like consistency and eaten in small balls with a dipping soup or sauce. Fufu is one of the most common foods in Africa, especially in West Africa. The traditional method of eating fufu is to pinch some of the fufu off in one’s right-hand fingers and form it into an easily digestible ball. 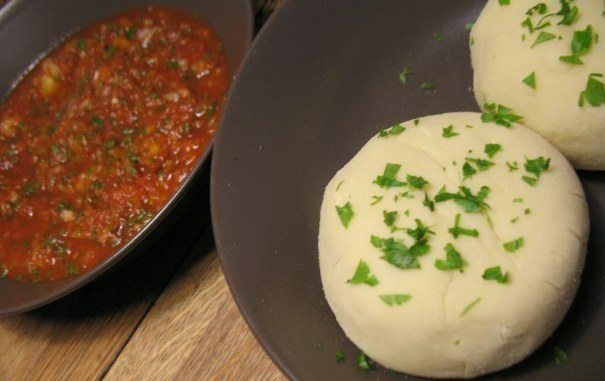 Kachumbari is a popular East African recipe. 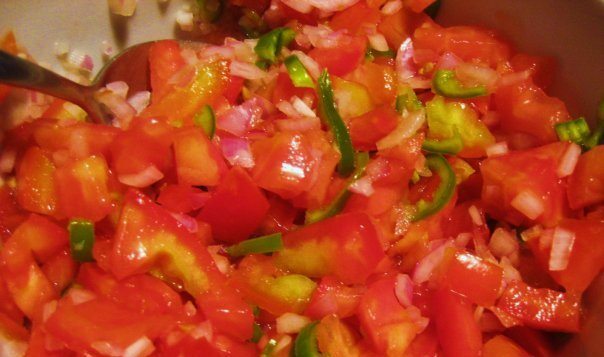 It is a fresh (uncooked) tomato and onion salad dish consisting of chopped tomatoes, onions, and chilli peppers (and salt to taste) that is common in East and Southern Africa. In places like Kenya, kachumbari always goes hand in hand with nyama choma (roast meat, mainly beef or goat). I think those living along the coast (Coasterians, as we call them) also have kachumbari with pilau. Nshima is a cornmeal product and a common staple food in Zambia, Malawi and the Democratic Republic of Congo. It is more like a Central African food made from ground maize (corn) flour. During the best of times, the nshima meal is always eaten for lunch and dinner. This is the case during and after the harvest season in the villages in rural Zambia. This is from about April to November when the food reserves are generally adequate. Nshima is so widespread such that almost all indigenous African languages probably call nshima by a different name according to the specific area language and dialect variation. 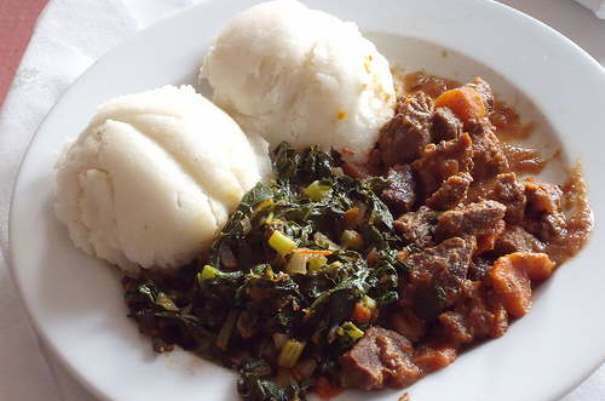 It is very similar to ugali or posho of East Africa, sadza of Zimbabwe, pap of South Africa and fufu of West Africa. Tuwo shinkafa, a popular African food made of thick rice pudding usually eaten with spinach, meat (usually goat or mutton) and smoked fish. 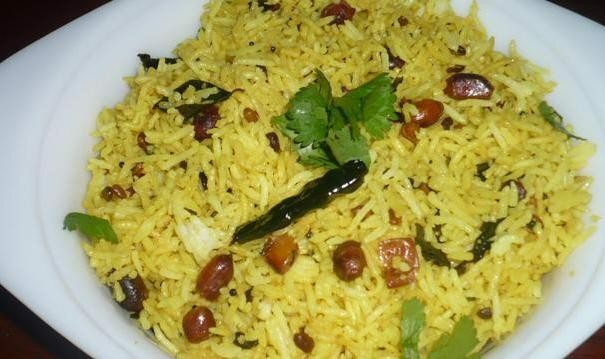 Coconut rice, a rice dish made with coconut milk. Tuwo masara, corn flour dish eaten also in the northern part of Nigeria.